The Cool Shade, coming to the rescue of overheating grow rooms everywhere. These Ecotechnics Cool Shades / Tubes offers a simple, yet highly effective solution to heat build up issues by running your extraction gasses passed the light bulb and out of the grow room. This drastically reduces the overall temperature, also allowing you to place your lamps closer to your plants. These brilliant reflectors take up to 90% of the heat away from your plants and put you in greater control of your grow room environment, and less light loss. Measuring 150mm Diameter and 400mm in Length, these Ecotechnic Cool Shades allow for easy connection to ducting and fans. 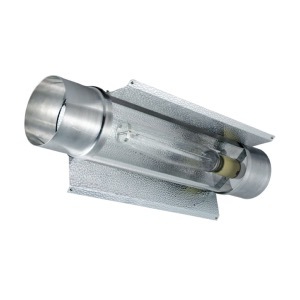 Ideally suited to any of our ballasts, these reflectors are a great addition to any grow room. Please note: To take full advantage of the Cool Shade Tube you must connect a suitable extraction fan and ducting.